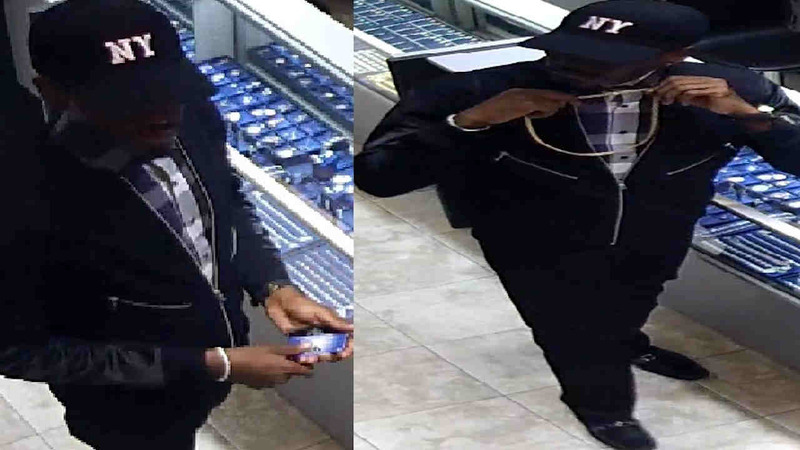 DIAMOND DISTRICT, Manhattan (WABC) -- Police are looking for a man in connection with a robbery attempt in Manhattan's Diamond District. But the man didn't get anything -- the holdup was foiled by a weapon malfunction. Around 4 p.m. Sunday, at Rafaello and Co. Jewelry on West 47th Street, a man approached two employees and asked them to see a chain inside a display case. According to the New York City Police Department, one employee went to the back of the store to get a key to the case. Once he was gone, the suspect pulled out a gun and pointed it at the remaining employee's head, police said. When she screamed, the other employee returned to the front and fought the suspect for his gun. But when the gunman stepped away and started to fire, his gun fell apart. The suspect fled the store empty-handed eastbound on 47th. The individual is described as black, 20 to 25 years old, 6 feet 2 inches, 160 pounds, and he was last seen wearing a black jacket, black pants, black shoes and a black baseball cap.